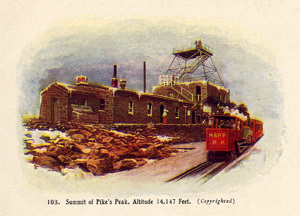 A timeline of historical events associated with Pikes Peak, the Cog Rail, the Pikes Peak Highway, Glen Cove, the Summit House and notable people such the Ute Indians, President Jefferson, Zebulon Pike, Steven Long, Edwin James, Julia Archibald Holmes, Spencer Penrose, Katharine Lee Bates and the Frozen Five. Please select a timeframe below to see events that occurred during that period. Though the Ute Indians were the first documented people around Pikes Peak, it is very likely that a much younger generation of native Americans roamed the Rocky Mountains some 12,000 years earlier. Known as the Clovis Culture, these were descendants of an ancient people who crossed the Bering Land Bridge between Russia and Alaska at the end of the last ice age. Juan Bautista de Anza, then Governor of the Province of New Mexico, leads a force of about 800 soldiers and Ute and Apache allies against Comanches at what is now Manitou Springs and Colorado Springs. It is not known whether he or any of his army climbed Pikes Peak. President Thomas Jefferson completes the Louisiana Purchase. Purchased from the French for approximately $15 million, more than 828,800 square miles, including Pikes Peak, is added to the United States. James Pursley (or Purcell) spends the winter with the Ute Indians in South Park, and finds gold flakes in a stream. He is believed to be the first known “American” in Colorado. President Jefferson dispatches explorers to survey the new land acquired though the Louisiana Purchase. The well-known Lewis and Clark expedition is sent to explore the northwestern part of this claim. However, another party, led by Lt. Zebulon Montgomery Pike (pictured to the left) is sent to explore the southern region. Pike and his men leave Missouri in the summer of 1806 and take four months to reach the area. As they neared the front range of the Rockies, Pike spotted what he called a “small blue cloud,” which later revealed itself to be a towering mountain. When they reached the area that is now the city of Pueblo (about 35 miles to the south), Pike ordered most of his expedition to build a small stockade, while he and three of his men struck out to further explore what he named Grand Peak. When Pike and his men left St. Louis the previous summer, they had thought their exploration would last less than six months. As such, they had not prepared for the cold weather that was now upon them. When Pike reached the base of the mountain, he certainly felt the affects of this poor planning. Clad only in summer clothes, they would spend only one very cold November day reaching one of the lesser peaks, which historians now believe was Mt. Rosa. Despite his efforts, he left the area without reaching the summit of his newly discovered great mountain. While many claim that Pike stated that no man would ever reach the summit, a closer review of his journal shows that Pike thought the top was indeed obtainable – just not by him, at that time, given his summer clothes, lack of food and waist-deep snow. For more information about the life and travels of Lt. Zebulon Pike, please visit: www.zebulonpike.org. The first recorded ascent of Pikes Peak. In June of 1820, Major Steven Long and 22 men leave what is now Nebraska to explore the source of the Platte River. After three weeks of crossing the tall grass prairies of eastern Colorado, the expedition catches their first glimpse of the snow-capped Rocky Mountains. Following several more days of marching, the Long Expedition finally reaches the base of Pikes Peak. Being rather impatient with the progress they had made so far, Major Long is anxious to continue on the expedition and return home. However, Dr. Edwin James (pictured to the left), a naturalist with the expedition who had been personally selected by Major Long, convinces him to wait a couple days at this location, so James could climb Pike’s Grand Peak. Long reluctantly agrees and grants Dr. James three days to climb the peak, make his observations and return to camp. Unlike Pike’s winter attempt, James’ climb is unencumbered by the weather. Dr. Edwin JamesDr. James and two men reach the summit on the afternoon of the second day and spend only an hour on the summit before it is time to start the trip back down. They spend the second night just below the summit, but without blankets or provisions, as they had lightened their load the day before to speed their ascent. James returns to Long’s encampment on the night of the third day completely exhausted. However, not only has he managed to scale the mountain, he also has made many notes in his journal and returned with many examples of previously unknown plants and flowers, including Colorado’s state flower, the blue Columbine. Impressed with his efforts, Major Long names the mountain for him, declaring it James Peak. The official name of “Pikes Peak” is adopted by the Army’s Topographical Corp, led by Major John Charles Frémont. Even though Dr. James was the first to reach the summit of the mountain, Frémont believes Pike earned the naming rights as the first American to document the existence of the mountain. Moreover, he imposes his view by referring to the mountain as Pikes Peak in his many journals and maps. A different mountain in Colorado was later named James Peak in honor of Dr. James’ contributions. The Summit House was again upgraded and enlarged to accommodate even more guests and facilities. An elevated tower was first constructed on the ground near the Summit House. It was later moved to the roof on the north end of the building, which enabled tourists to experience the complete panoramic view from the peak. This privilege cost them 25 cents. A second story and observation tower are added to the Summit Auto House (now called the Pikes Peak Highway Summit House). 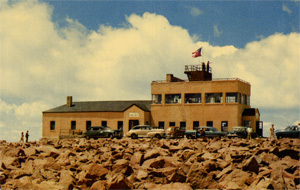 An advertising flyer describes the building as having Free Parking, Glassed-In and Heated Observations Room, Open-air Promenade Deck, a Crow’s Nest Observation Lounge, large Telescope and Field Glasses and a Pike National Forest Visitor’s Register. The advertising flyer also contained a sticker for your windshield. The photo above on the right was likely taken from the Observation Tower on the other Summit House. Renovation of Glen Cove Inn is completed on June 14.